As LTE and VoLTE are becoming mainstream, the industry is turning to meet the new challenges presented by 5G, even though the exact details of the relevant standards are still being discussed. The 5G vision is one of empowering the network society through three main use cases: enhanced mobile broadband, massive machine-type communications and ultra-reliable, low-latency communications. These use cases lead to a diverse and often contradictory set of requirements which can only be realized economically through low footprint cloud-native network functions providing discrete network slices. Virtualization and containerization are therefore essential foundations for this new 5G core. 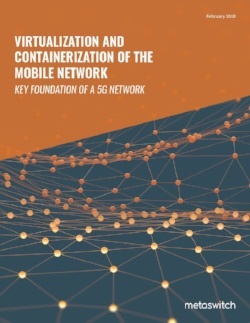 This paper documents a Proof of Concept project carried out at Telenor Research in Oslo, Norway, with several partners including Metaswitch Networks, to investigate the state of the art in virtualization and containerization of the mobile core. This project ultimately demonstrated that it is possible to virtualize the entire mobile core, and that containerization of some elements is possible today, with more being possible soon.